The larger Unit (415mm L x 165mm W x 135mm H) are designed to hide a 6-way socket extension block and all the cable spaghetti. 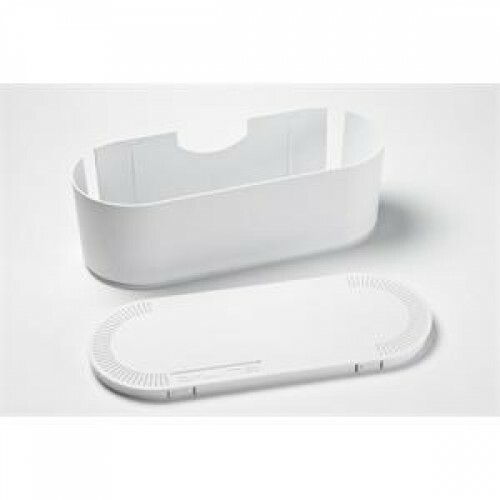 D-Line Cable Tidy Units provide a stylish and easy way to hide cable clutter in homes and offices. Cable Tidy Units are ideal to hide TV cables, Computer wires, and Gaming cables, and hide Socket Extension Blocks too... wherever there is cable clutter!. Ideal for offices and home, the units are designed to provide a neat and stylish solution that blends with decor. With all cables neatly concealed, wasted space is returned and surfaces become easier to clean. Both sizes allow for the height of popular transformer plugs. Simply insert the cable clutter into the Cable Tidy Unit, next direct cables to go left or right or upward using the three exit slots, then attach the click-lock lid.